Both panels were acquired for the Collection in 1929 from Lucerne Fine Art, Switzerland. One month later, Georg Gronau wrote a report in which he praised the quality and artistic merit of these works and the poetic landscapes in which the narratives are set. It would seem that Gronau was already familiar with them when they were in a private London collection and his text indicates the order in which they were displayed at that date. Since the time of their publication in the Munich catalogue in 1930, these two panels have been attributed to the Pseudo Boccaccino, an attribution to which Gronau also subscribed. The most recent studies on that artist, who was active in Venice in the early 16th century, have identified him as Giovanni Agostino da Lodi, who worked in a style that combined Lombard and Venetian elements. These panels were published by Berenson in 1968 as by Lodi. The story depicted is taken from Ovid’s Metamorphoses (I), a source frequently used by Renaissance artists when depicting mythological episodes. In the 1988 catalogue of works from the Collection, David Ekserdjian noted that it was difficult to connect these two landscapes with the story of the nymph Syrinx as recounted in Ovid’s text. Chronologically, the story begins when the god Pan, half-man, half-goat, tries to win the nymph’s heart with his music. Syrinx, however, had dedicated her virginity to the goddess Artemis and on finding herself pursued by Pan, runs to the naiads asking for help. To save her virtue, the naiads transform her into reeds, as we see in the second panel in which Syrinx is depicted with her arms replaced by leafy branches. According to Ovid’s account, when Pan went to embrace her, he found himself surrounded by the reeds, whose sound pleased the god of shepherds and flocks. He made a musical instrument known as a syrinx or set of panpipes from them. The stream in the foreground has been identified as the crystalline Ladon. 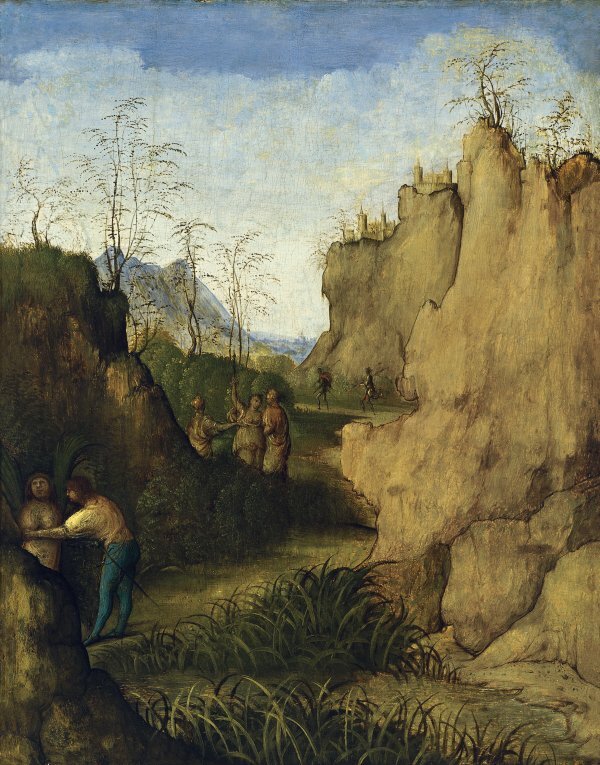 The scenes in the middle and background planes are difficult to interpret within this context. In the panel of Pan and Syrinx the nymph and the male figure pursuing her have been identified as Daphne and Apollo. Still unidentified in the other panel of Ladon and Syrinx, however, are the three figures in the wood: a woman holding a lance and two soldiers walking round the foot of a mountain. Also difficult to explain is the transformation of Pan as he goes to embrace Syrinx, abandoning his usual guise and transforming himself into a human being. In Ekserdjian’s opinion the artist’s interpretation of Ovid’s story may be due to the particular literary source that he used, perhaps a free or incomplete translation of the text. Mina Gregori has suggested that in fact the panels depict a different, as yet unidentified mythological tale. It has been suggested on the basis of their format and subject that these panels, with their praise of woman’s chastity, formed part of a cassone or wedding chest.